So, @CG_SBCrumb ... when do we get to see his kit? Wow, not even leaving a ray of hope. And I hate CG once again. Thank you capital games for creating so much hype around a character, only to make it possible for probably less than 1% of the community to be able to acquire him. I appreciate the big middle finger you guys threw at us. Especially since we have many other toons we should be farming. If you guys would have made this a raid that is harder than the AAT but easier than the sith raid, this would be more successful. Just saying. Been farming these guys as much as i could since they were released. 3 refreshes of Cantina and all 8 attempts on hard nodes. I am so far from getting them all 7* there is no way I would buy packs to finish them off. @CG_SBCrumb Are we getting the Road Ahead (real one, with words, not a Christmas Tree shaped puzzle) and a Revan kit reveal today? The event will probably come back in three months. Introducing it now lets people know what it is and they can try a phase or 2. Only a true mongo-whale will be able to get through it this time. This is good. But we all now have a road ahead if we want to get Revan the next time or the time after that. Hardly anyone will be way ahead of anyone else here at this moment. Glad they told us now. Now I can stop refreshing and buying shards with my crystals because there is no way I'll be close to 7 starring and gearing these toons up in time. See ya next round, Revan! They were made farmable, 3 of them with hard nodes not even a month ago. This is just a completely ridiculous timeframe to release such an anticipated character with such requirements. I expected more notice, especially because of the harder farms. Not shorter! Another such beautiful gift for the P2W ! The old republic is farmable for a SHORT TIME and we still find ourselves the FREE-TO-PLAY in the CRAPPPPP !!! It disgusts so many players ur actions and u don't even realize it as long as ur bank account fills UPPP ! Expect anything. The return will probably be timed so that people who targeted some logical date (like the 6 months) will be just short of unlocking him, to milk some additional cash. Better get them ready asap. Not going to lie, I'm surprised. I expected a release closer to early November. Releasing it this early puts it out of reach of the "dolphins" who occasionally spend... I assumed they would wait until more players would be within range where the packs would make it feasible, rather than the packs + several vaults. I just read on AhnaldT101's server that the release date for this event is the 18th of October. That's 7 days from now (for me at least), how was anyone ever meant to farm the characters in that time unless they were already farming them? Selling the packs separately makes it extremely clear that you do not care about "the little guys" and with this event you only ever wanted to cater to the whales. I was happy to buy a faction pack like the ones with SOLO but 3 separate packs for 5 characters is a joke and so is the time we've been given to prepare for this event that you know we are very excited for. 13 days to be exact. They were released to farmable nodes on September 26 in the evening at the end of the day. We got the news today about it so still a days gap. It just shows that the developers are completely and utterly tone-deaf to the vast majority of their player base. It comes as no surprise to me, and shouldn't really to almost anyone working in a capitalism-based society. Can't have every manager/owner/chair be like Richard Branson and actually give a hoot about the little guys. I just keep doing my thing, farming what I want when I want. Will not chase the meta for this exact reason. Makes little difference to me, i wont be ready, i knew i wouldnt be and if the hard nodes go back to 5 then i might get it at round 3 not round 2, im still ok with this as anyone that couldnt see a panic farming scenario unfolding must have been blind (though we were never certain that OR would be needed until todayj. Wow, they really put a lot of work into an amazing character that NO ONE is going to want to get. Way to ruin it. You're gonna lose so much more money than you're going to make for this. This feels like an incredible misdirection and deception on CGs part. If memory serves, the Solo toons were released and node-assigned first. Following history it was logical to expect that they'd be utilized first, especially given cryptic hints not so long ago. To completely deviate from this (yeah yeah, assumption I know what that makes me) right as folks are wrapping up their Solo shard counts and swerve right into this when most folks are not going to be close to finished is completely underhanded. And it's not even trying to hide from the moneygrab that we all know it is. I'll be missing the 7* for the first time, for one of these types events. As a launch player, that disappoints me that it took this long...but as a logical player, I saw it coming a mile away and just reinforces my decision to stop giving them money. They clearly don't value the player who was giving it to them. There's a fun thread going on Reddit that says what I really want to say far more succinctly. Solo toons were released when the movie was released and were meant to promote the movie. They didn’t decide to release the movie in April. They did the bare minimum of releasing only the key main characters. Other than choosing Nest over Beckett (spoilers of his alignment?) or rangetrooper over Dreyden. This is the biggest kick in the nuts ever!! Im not even close enough to panic farm and I've been farming old republic since the dropped in shipments. Smh. 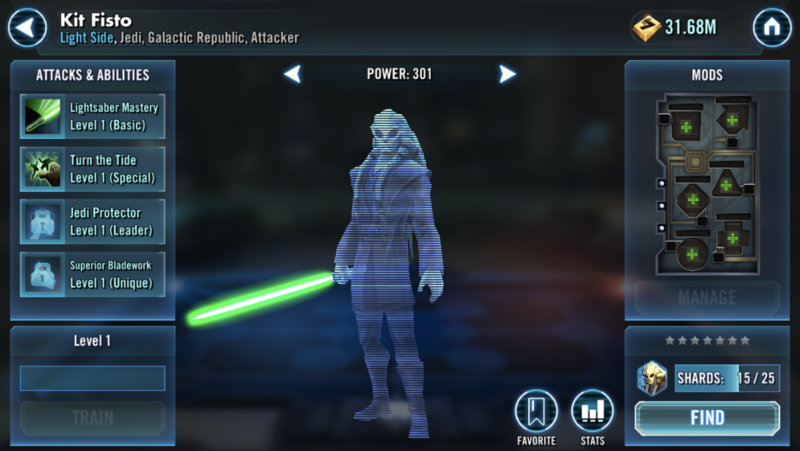 CG pushing the small spenders out of the game.